Photo provided by Kyle Magnuson. Namhansanseong is a mountain fortress, designed as an emergency capital for the Joseon dynasty in the early 17th century. Manned by Buddhist monk-soldiers, it was built to withstand a Sino-Manchu invasion. Its architecture is a fusion of Korean, Chinese, Japanese and European military fortification concepts, designed for the use for the first time of Western firearms. Two advanced defensive posts at Sinnam. The earliest remains at the site date from the 7th century, but the surviving civil and religious buildings are of much more recent construction. Namhansanseong was the ‘contingency capital’ for the Korean Joseon Dynasty, built as a mountain fortress in the early 17th century. I visited it on a day trip from Seoul – although it lies only some 25km outside of the capital, it took me 1.5 hours to get there by metro and bus. Looking at the number of large parking lots and restaurants, the site must see huge crowds during the weekends (over 3 million visitors already in the year 2010, before WH inscription!). On a weekday though, the place is the domain of elderly hikers. Most of them actually got off one bus stop earlier than I did, for the start of the trails that run on and alongside the walls. I eventually found myself at the roundabout of a tourist village, wondering what to do. I noticed some more traditionial looking buildings a bit to the north. These turned out to be the newly restored Emergency Palace, plus ticket and information stalls. I first went to get a ticket, which I was given for free although there is a usual entry fee of 2,000 Won. Maybe it was a special day, or were they just happy to welcome a foreigner? The ticket by the way is for the Emergency Palace only, the rest of the site is free of charge. At the entrance of the Palace an older man in traditional custome was strategically posted to catch any innocent visitors. He turned out to be an official guide with good English. So he enthousiastically took it upon him to show me around the Palace and tell all about it. 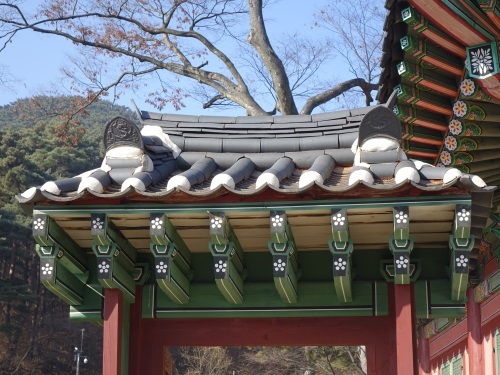 Besides an ancestral shrine and offices, the Palace contained modest living quarters for the king and the crown prince – I gathered from the guide that their wives stayed in Seoul! The buildings have been freshly painted and just as many other South Korean sites are a bit dull in decorations. After the Palace I went for a walk. One can hike the whole wall along the four entrance gates. That was too much for me, so I walked from the center outwards first to the East Gate and later (after lunch) to the South Gate. The route to the East Gate goes on a normal pavement through the not so interesting parts of Namhansanseong’s tourist town. The gate itself, though spectacularly located against a steep hill ridge, lies next to a heavy travelled road. The South Gate is (according to the nomination file) by far the most visited of the gates. It seems to be the preferred starting place for hikers, the trails aren’t so steep here. I didn’t really know where to go and quickly retraced my steps to return to the bus stop. Looking back after having now visited all South Korean WHS, I must say that I found Namhansanseong the least interesting (although it has some competition of other recent nominations). There is actually a second location to this WHS (“the remains of two Sinnam advanced defensive posts”) which none of the reviewers has checked out yet – so maybe we can get a new angle from that? I visited this WHS in April 2017. Located on Mt. 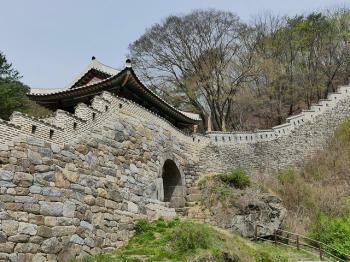 Namhansan mountain, this fortress seems to be the preferred inscribed fortress among locals mostly because of the nature trails and hikes in the provincial park. I spotted a couple of interesting birds plus several common and black squirrels along the way. In Spring, the fortress wall and pavilions are hidden well in the thick acacias. 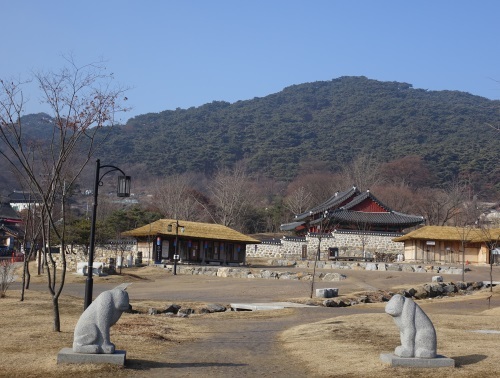 The loop hike is a medium difficulty 7.5km hike but is less photogenic and striking overall than Hwaseong and has less impressive defensive structures. Apart from the gates, the Emergency Palace is worth visiting. My personal highlight was visiting the serene Buddhist temples of Mangwolsa and Janggyeongsa built by Buddhist monk-soldiers. These are situated 500-800 metres from the East Gate on a very steep hill. Both temples were fully decorated with colourful lanterns for Buddha's birthday when I visited. The UNESCO inscription plaque is just next to the tourist information booth near the Emergency Palace (closed on Mondays) and there is another stone marker near the East Gate. To get to Namhansanseong it takes around 90 minutes. First you have to get to Sanseong Station by subway (exit 2) and then catch bus number 9 (all buses accept T Money Cards but you can also pay the driver directly). The afternoon return buses are very frequent so wait for one with enough free seats to go down the several hairpins! Overall I enjoyed my visit but I'd rank it only slightly better than the Ganghwa Dolmens. When my plane landed on Incheon International Airport, a flight attendant informed me a shocking message that my connecting flight had been rescheduled for 8 hours and recommended me to spend time in airline lounge or take a city tour, I decided to combine both recommendations by had breakfast, took a shower in the lounge, gathered all transportation information by airport free Wi-Fi and then went to Namhansanseong, this year new World Heritage Site. Since this is not my first time in Seoul, I promptly took a comfortable airport rail to Seoul Station and directly took a metro system to Sanseong Station. From exit no.2, I just followed a group of hikers to a nearby bus stop and took bus no.9 and within 30 minutes I was arrived in my destination, Namhansanseong. The bus stop was located in the center of tourist village with many restaurants and cafes. I was confused and did not know where I should go. At first I planned to follow other tourists but they went to every direction! I saw a sign mentioned about a palace so I decided to visit the place, the palace turned out to be a very new rebuilt and still a construction site, and suddenly I saw an elderly hiker using a small lane behind the palace's shrubby garden so I decided to follow him. Unknowingly I entered one of the hiking routes to the Westgate, along the way I saw a nice traditional pavilion in the middle of beautiful autumn forest, a lovely spring and picnic ground, the route actually was not hard, but I was not proper equipped with hiking shoe, so not really a good time at all. At last I reached the top of the mountain and finally saw the wall of Namhansanseong. From the interior view the wall was a part of the mountain top flatland with short parapet, but when I looked beyond the parapet, I found a very high and steep wall with thick forest. The design really provide no chance for enemy to keep stronghold on the foot of the wall, while provide broad area to hold bigger army inside the fortress. 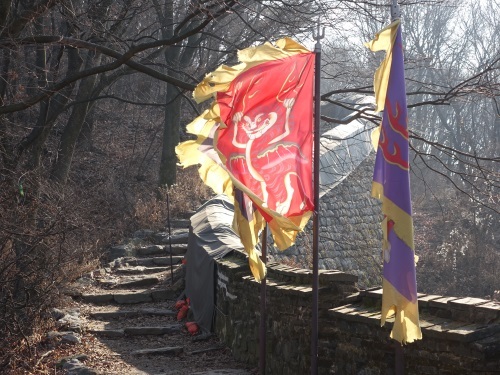 From the impregnable Westgate I could see a great view of Seoul, then I visited Gukcheongsa Temple, but there was nothing much to see, after that I walked along the wall, saw many elements of fortification designs until I reached the Northgate. I saw hundreds of full equipped local hikers from all ages that were enjoying the beautiful autumn foliage along the way. Since my first visit to South Korea I noticed that hiking is one of national obsession, and surely Namhansanseong is one of the easiest places to hike near Seoul. I really enjoyed the route for its beautiful nature and the wall was liked a white dragon swimming in the sea of red leaves. Near the thick Northgate also has great pine tree forest that really enchanted the valley. After 3 hours I decided to end my hiking and walked back to bus stop and ended my trip in Namhansanseong. In my opinion, Namhansanseong is not a stunning or impressive site, the wall indeed has its own charm and really interesting design, but for casual travelers and hikers, the lovely surroundings and view are the main reason to visit. The old temples, shrines and pavilions in the forest are nice but have no architectural outstanding merit compared to other World Heritage Sites of South Korea like Bulguksa or Haeinsa. Another comparison would be Hwaseong of Suwon. 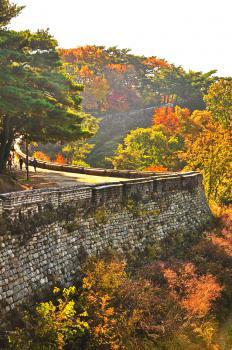 While Hwaseong is city wall that built on mountain and river plain, Namhansanseong is truly a mountain fortress. The designs of both are so different. However the design of Namhansanseong is almost quite harmonious with countless parapets, while at Hwaseong I could see many styles of fortifications from mountain fortress, unique water channels, high wall, towers, turrets, and impressive city gates, so for me visiting Hwaseong is more interesting than Namhansanseong. I have a single advice for anyone who is planning to visit Namhansanseong; a nice hiking shoe would be your priority, if you don't want to raise other hikers' eyebrow like me. The fortress is impressive, the gates certainly stand out, and the view of Seoul from the South is stunning on a clear day. 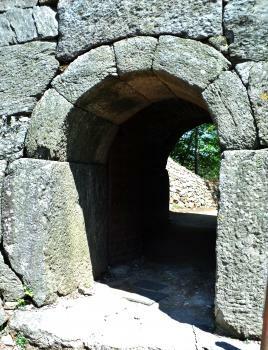 The fortress today is primarily from 1624, but fortifications have been located here since Baekje and Silla in the 7th century. The fortress played a major role during the Joseon dynasty, acting as the protective barrier of Southern Seoul, and more importantly as a temporary palace and headquarters for the king in times of peril. 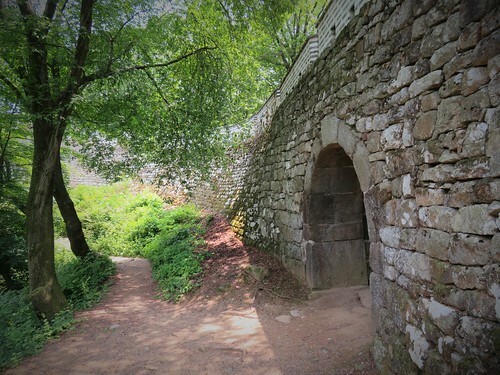 (In which purpose it was used on occasion) Namhansanseong itself is one of the better preserved fortresses in Korea. The walls are higher than most, while many of the gates are particularly formidable. The primary rebuilding phase is largely a response to the Japanese invasion of 1592, and the probability of Manchu incursions (which did occur in the 1630's). I did notice one section of the wall was being almost completely rebuilt, but for the most part, the fortress is highly authentic. (Probably more 'original' than Hwaseong Fortress). The outer wall fortress, which was taken by the Manchu forces is largely in ruins. There are a select few original wooden buildings, but most have been rebuilt or restored over the centuries. The Temporary Palace is the primary focus for restoration. Getting to the fortress is not particularly hard, there is a (somewhat) nearby subway. Buses also drop off visitors within the lower interior of the fortifications. This is one of the representative fortresses of Korea. If you enjoyed Hwaseong, you will surely enjoy Namhansanseong as well. One plus is the beautiful location, the old pine trees are numerous and the entire area is a provincial park. Update: I revisited this fortress in order to hike the entirety of the wall and visit the outer portions. After 4-5 hours of hiking I accomplished this, though not without great effort and exhaustion! I have now visited all gates, and secret gates, and most Buddhist temples. It should be known before attempting any circumference hike that there are extremely steep sections, heat is an important factor to consider, and the Outer fortifications are primitive. What I mean by primitive is that facilities are non-existent, and signs for hikers are recent additions or not present. This portion of the fortress is in ruins and collapsing, this is likely because of two reasons: the outer fortifications are very hard to maintain based on location and this portion of the fortress saw some of the worst damage during the Manchu Invasion of Joseon. 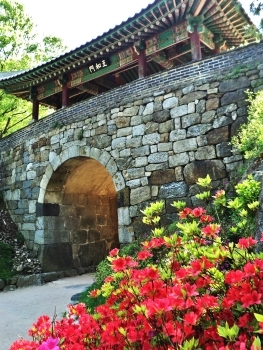 The fortress lies some 25km southeast of Seoul. It can be reached via Sanseong Station on the Seoul Subway Line 8, Exit 2 - and then change to a bus No. 9.